Summer has arrived and birds are looking for a nice, cool place to relax. Pools make a great bathing, pruning and drinking spot for birds and ducks. They leave behind feathers and poop, making your pool area a toxic waste zone. For both birds and ducks, scare tactics work well; they are humane and inexpensive ways to get rid of pest birds in your pool area. The Bird-B-Gone Balloon can be filled with a little water and it will float around your pool, giving the illusion of a dangerous situation. Other visual bird deterrents are Flash Tape and Reflective Diverters. Both can be hung anywhere in the general area of your bird problem, like trees around the pool, poles, gazebos, etc. When these products blow in the wind and reflect the sun it causes confusion and scares birds away. 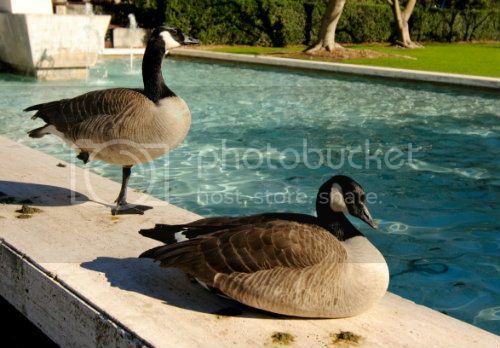 If geese are around your pool area, use Migrate Goose Repellent to get rid of them. Spray the Migrate Goose Repellent on your lawn and shrubs to deter the geese. The repellent is a humane product made of grape extract; it will not harm the geese or your lawn. It causes an unpleasant sensation for geese when ingested, causing them to leave your property in search of more appealing food. Sound bird deterrents, like the Sonic Shield, are great for keeping birds away too. The Sonic Shield is a motion activated sound device that replicates a vicious barking dog when triggered. If ducks or geese are hanging around your pool area at night, the Sonic Shield will flash a bright LED light frightening them from the area. Spend your summer enjoying the pool! Keep the birds out!